Do you feel that your home router is underperforming and not providing you with the strong and stable signal you need to enjoy web browsing, high-definition audio and video streaming, and online gaming regardless of whether you’re connected to the router via an Ethernet cable or wirelessly from across your house or apartment? Then you need to upgrade to a long-range router, and, to help you make a wise purchase decision, we’ve selected what we consider to be the top 5 best long-range routers in 2018. 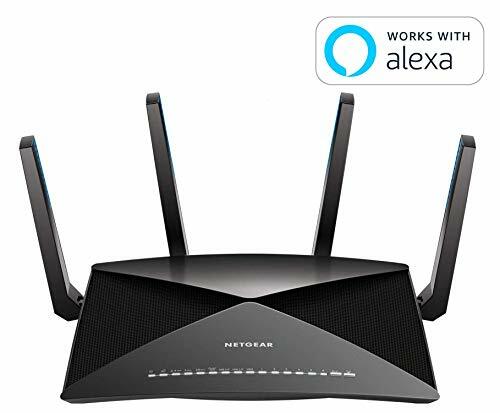 The Nighthawk X10 is a recipient of the Red Dot Design Award, which is an international product design and communication design prize awarded by the Design Zentrum Nordrhein Westfalen in Germany. It has also been selected by numerous magazines and tech review channels as the best Wi-Fi router currently available, which justifies its rather steep price. But if you think about it, $400 isn’t a lot of money for a high-end smartphone, a powerful gaming rid, or a top-of-the-line Internet-connected television. Yet, all these devices are only semi-functional without a reliable Internet connection. Why is it then that $400 seems like a lot of money to spend on a long-range router packed with state-of-the-art features and technology? Perhaps it’s because we seldom realize what high-end routers have to offer. The Nighthawk X10 is powered by an ultra-fast quad-core processor clocked at 1.7 GHz. Thanks to the beastly processor, the X10 offers combined wireless speeds of up to 7.2 Gbps with 802.11ac and 802.11ad Wi-Fi technology, enabling simultaneous ultra-smooth 4K streaming, VR gaming, and instant downloads. Thanks to four patent-pending external active antennas and MU-MIMO support, the X10 can deliver ultra-fast Internet speeds over long ranges to all clients at the same time. Integrated into the X10 is Plex, which is a client-server media player system that allows you to aggregate all your personal media and access it with the same convenience as you select shows on Netflix. 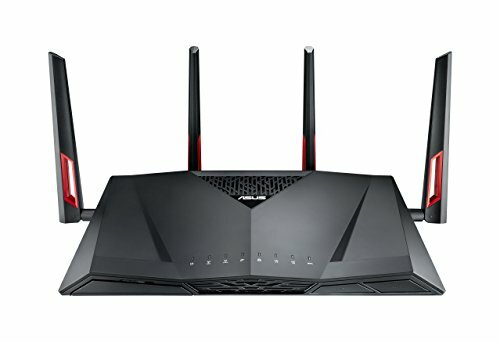 Combined, the above-described features make the Nighthawk X10 the best long-range router in 2018. That said, good alternatives exist, like the four long-range routers below. At nearly half the price of the Nighthawk X10, the Asus RT-AC88U is an attractive option for people who demand maximum performance but are not keen on spending over $400 to get it. The RT-AC88U supports MU-MIMO technology, allowing it to connect multiple MU-MIMO-compatible clients at each device’s maximum speed simultaneously. 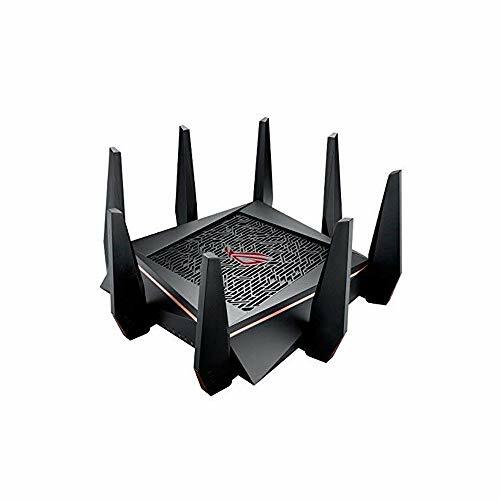 The router can deliver a combined 3167 Mbps Wi-Fi speed for lag-free simultaneous content streaming and online gaming. Yes, the X10 offers combined wireless speeds of up to 7.2 Gbps, but it’s unlikely that you would ever notice any difference in practice, especially if you’re currently using a $50 router. The RT-AC88U has several handy features intended to help you enjoy the fastest Internet speeds possible. Among these are Smart Connect, ASUS AiProtection, WTFast Game Accelerator, Adaptive QoS, and Link Aggregation. Smart Connect automatically chooses the best band available for you so that you don’t compete with your neighbors for bandwidth. ASUS AiProtection is a capable security suite by Trend Micro that ensures your online experience is safe and secure, combining automatic vulnerability detection with malicious site blocking and parental controls. WTFast Game Accelerator automatically performs route optimization, choosing the most efficient route for game packets, which results in consistently lower ping time and minimal packet loss. Adaptive QoS prioritizes some activities over others, and it’s up to users to select whether they would prefer to allocate more bandwidth to gaming, web browsing, or media streaming. Finally, Link Aggregation combines two teaming LAN ports into one superfast wired connection. 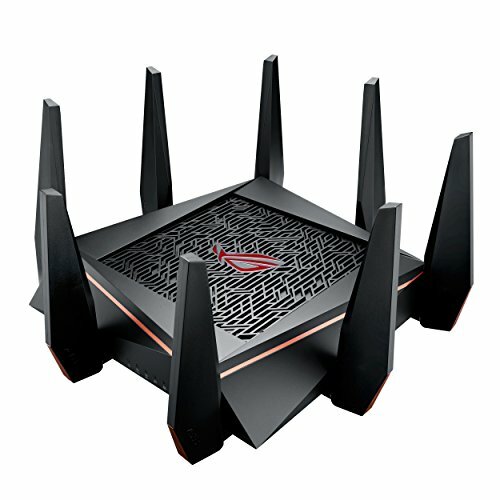 If four high-performance antennas don’t seem enough to you, why not get a long-range router with eight, like the Asus ROG Rapture GT-AC5300? Designed with gamers in mind, the ROG Rapture resembles the facehugger from the movie Alien, and it also performs as if it were enhanced with alien technology. Inside the router is a top-of-the-line 1.8GHz 64bit quad-core processor that outperforms even some budget desktop and laptop computers. Thanks to this processor, the ROG Rapture can handle any load, including simultaneous wired and wireless media streaming, USB data transfers, and LAN gaming. Apart from the processor, the router also relies on the exceptional performance of the latest 802.11ac 4×4 MU-MIMO technology, which offers maximum throughput of 5334 Mbps and coverage of up to 5,000 sq. ft.
Just like with the Asus RT-AC88U, you also get to enjoy the benefits of Smart Connect, ASUS AiProtection, WTFast Game Accelerator, Adaptive QoS, and Link Aggregation. But the ROG Rapture comes with one extra feature that just might convince you to purchase it instead of the RT-AC88U: VPN Fusion. With it, you can run a VPN and an ordinary Internet connection simultaneously. As such, you can stay anonymous while browsing the web without sacrificing your in-game pings. 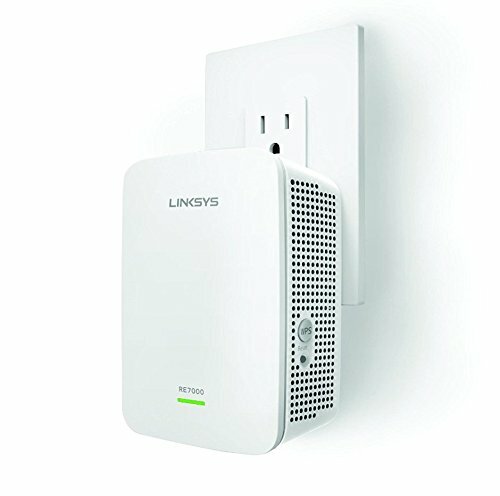 You may know Linksys as a manufacturer of reliable budget-friendly routers, but the company also dabbles in the high-end territory. The Linksys EA9500 Max-Stream is an app-enabled home router with too many features to name them all. To start with, the Linksys Max-Stream is one of the easiest long-range routers to set up and configure. If you live in a very large household, you can pair your Linksys Max-Stream router with Max-Stream Range Extenders for increased coverage. Because all Max-Stream devices support seamless roaming, your devices will automatically switch to the strongest Wi-Fi signal as you move around your house. Thanks to Tri-Band Wi-Fi technology and 4X4 AC, the Linksys Max-Stream is able to deliver the fastest Wi-Fi speeds achievable to multiple devices at the same time. The router has a powerful dual-core processor and 8 Gigabit Ethernet ports for wired connectivity without compromises. Linksys also added a single USB 3.0 port for external storage devices. 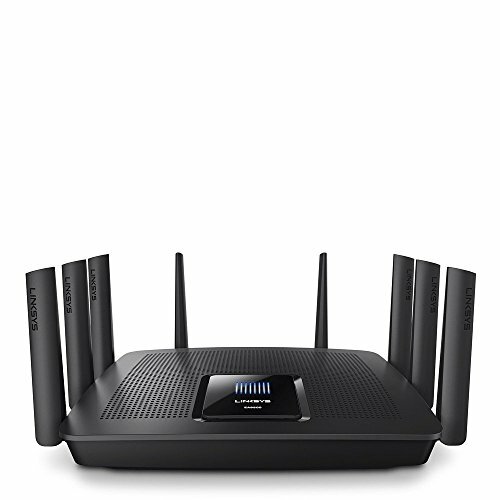 The Linksys Max-Stream can be conveniently controlled through the Linksys Smart Wi-Fi website or mobile app. You can monitor the performance of your home network, see who’s connected to it, create a guest network, and enable advanced wireless security settings to stay protected against cyber attackers. 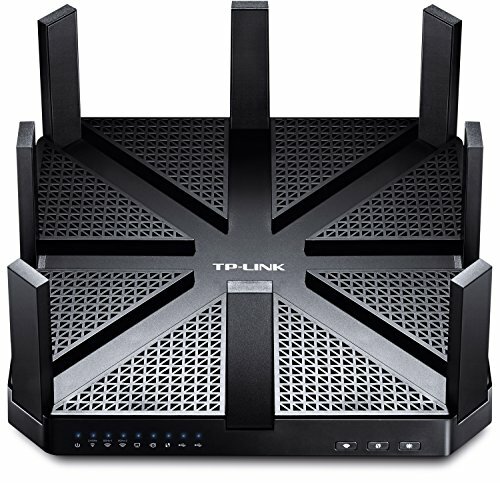 The last long-range router on this list, the TP-Link Talon AD7200, has eight beamforming antennas for maximum wireless performance and four full Gigabit Ethernet ports for unmatched wired speeds. It also has two USB 3.0 ports for storage devices, printers, and cameras. 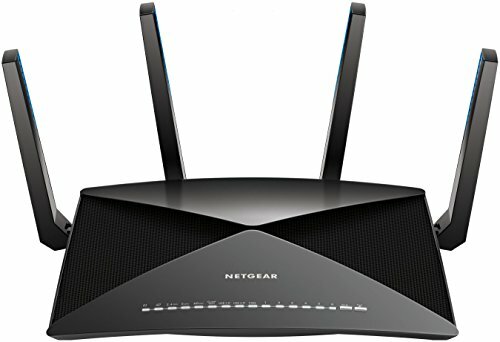 With such comprehensive connectivity options, the router greatly benefits from its powerful 1.4 GHz dual-core processor that can handle multiple connections at the same time without even coming close to its performance limits. 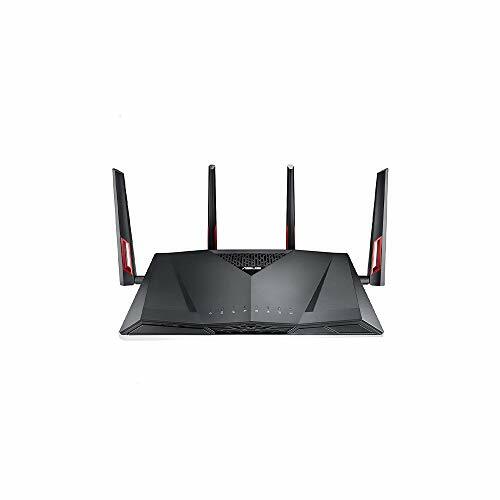 Like all other routers on this list, the Talon is packed to the brim with advanced features, such as MU-MIMO technology, 802.11ad wireless technology, and the support for 60 GHz Wi-Fi band, which dramatically increases speed and reduces interference. The Talon can be managed using the free TP-LINK Tether app for Android and iOS devices. The app lets you set up parental controls, create a guest network, download files even when computers and mobile devices are offline, and protect your privacy by channeling your Internet connection through a private network.